For repair information on this product please click here. Please check the connector for burn damage and proper spring tension prior to ordering. You can find information on testing for proper spring tension by reading this article. In most cases with the Canyon and Colorado, the connector does not need to be replaced. If speeds 1-3 have failed at the same time, leaving you with only high speed, the blower motor must be replaced at the time of resistor replacement, in order to have a lasting repair. Failure to do so will void your warranty!!!!!!!!! If all speeds have failed at the same time (may fail and come back), check the ground buss bar connection on the inner fender panel, behind the air filter. 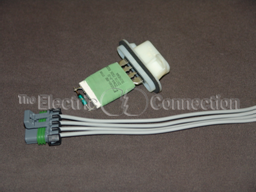 If you only need the resistor for this application, please click here. Works Great for Now ! From Anonymous of Tusin, California on 3/24/2015 . From Anonymous of High Point, North Carolina on 1/9/2013 . From Anonymous of Wilkes Barre, Pennsylvania on 10/2/2012 . From Anonymous of Phoenix, Arizona on 7/6/2012 . From Anonymous of Boca Raton, Florida on 6/27/2012 .